Ross 154 is a nearby red dwarf. Ross 154, also known as V1216 Sagittarii, lies in the eastern part of the constellation Sagittarius, northeast of Kaus Borealis (Lambda Sagittarii) at a distance of only 9.7 light-years (3.0 parsecs). It was discovered in 1925 by Frank Elmore Ross who first reported it in his "Second List of New Proper-Motion Stars," Astronomical Journal (36:856). 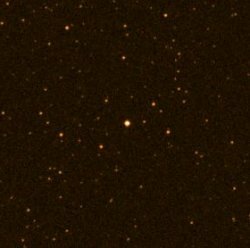 Its closest neighbor is Barnard's Star, 5.41 light-years (1.66 parsecs) away.